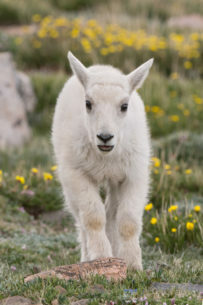 In the early summer I really enjoy photographing Mountain Goats on Mount Evans, Colorado. The Mountain Goat Kids are always entertaining. It was a late afternoon and this one was playing with a few others. It suddenly halted and looked in my direction and came right at me with a very inquisitive look.